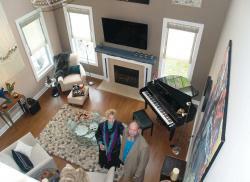 Above: Imogene Drummond and Cabot Parsons gathered in the showhouse living room. 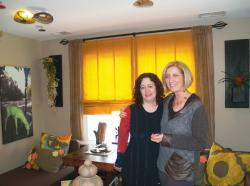 Below, right: Barbara Galazzo, left, and Maryann Syrek in the adult playroom. What if someone decided to take a newly built set of townhouses, work with a crew of noted regional artists and interior designers, and create an amazing show house filled to the rafters with both art and wonderful design ideas? Somebody did, and the house is opening next week at Glassbury Court at Cold Spring, on Route 9 in Philipstown. Fused glass artist Barbara Galazzo, well known to Cold Springers as one of the energetic, driving forces behind Cold Spring Arts, pulled together a team of artists and designers from Peekskill to Saugerties, on both sides of the river, and the result is a magical, gorgeous home that almost defies description. Glassbury Court is a 55-and-older, maintenance-free and energy-smart community. After gathering at the clubhouse on Route 9 and for a catered lunch, a small group of media joined Galazzo herself for a tour of the show house. “I really wanted to have a place where people could see art in the home setting,” she said. “Because when you go to a gallery, oftentimes you see it on a wall,” but the viewer has no idea how it would look in their own home. 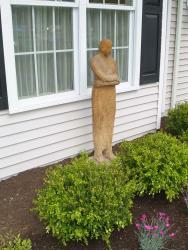 “I work a lot with interior designers,” Galazzo said. One designer saw her glass work that normally hangs on a wall, and asked if it could hang on a ceiling with light behind it. It worked. The show house is a new two-story town home. Each room offers a nod to a specific celebrity or newsworthy person. We began in the living room/dining room area, dedicated to Lady Gaga. The first bedroom, by Garrison designer Chuck Burleigh, features a cluster of Kaija Korpijaakko waxed paper cylinders marked with graphite, that echo the theme of birch trees. 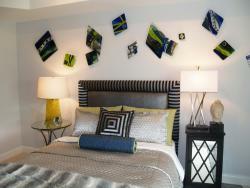 A Jessica Wickham bed frame completes the look, along with always distinctive sculpture by Lake Peekskill artists Ada Cruz. The hallway is checkered with small paintings by Cold Spring’s Julie Tooth, and the bathroom adorned with Imogene Drummond paintings that add a Caribbean/beach note to the room. “I think it’s very spa-like,” Drummond said. An office dedicated to the memory of the late Rutgers student Tyler Clementi was decorated by Darron Andress almost entirely in white, with many musical references and artwork by Martee Levi. Lithgow Osborne of Garrison curated a separate gallery space within what would normally be the home’s garage. “They required me to keep the site map [of the Glassbury complex] so I used it as the jumping-off point,” Osborne recalled. He incorporated photography and paintings into the bright space. The kitchen features a distinctive, abstract Grey Zeien painting and uses the shades of orange and blue to fantastic effect. 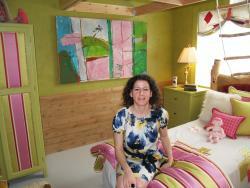 The adult play loft was designed by Maryann Syrek. It offers a charming array of entertainment options from the handmade checkerboard to musical instruments to fold-out sofa beds to a record turntable playing Joni Mitchell tunes. A woven room divider by Ada Cruz offers a soft division between the loft and the adjoining space below. A second bedroom inspired by Rupert Holmes was designed by Phyllis Harbinger, in shades of blue and green, with a theatrical, harlequin theme. “I took a loose interpretation of ‘the world is a stage,’” Phyllis said, and everything flowed from there. Blue and green Barbara Galazzo glass pieces adorn the walls. The child’s room, designed by Nicole Ashey, was my personal favorite. Natural wood, a loft bed, and shades of rose and green combine to create a magical, fairy-tale/adventure theme. Everywhere you turn in this room there is something to catch the eye. Decorated canvas drop cloth fabric covers the floor and the bed. “It’s really dedicated to any little girl with growing pains. It’s meant as a refuge and an escape…everything’s just a little kooky,” she said with a smile. The room is stocked with toys from local merchants. The artists, listed by area, are: Cold Spring/Garrison- Martee Levi, Sheilah Rechtschaffer, Cali Gorevic, Karen Reiter, Jaanika Peerna, Thomas Huber, Carinda Swann, Imogene Drummond, Kaija Korpijaakko, Barbara Galazzo, Janine Sopp, Julie Tooth, Jane Soodalter, Lucille Tortora, Grey Zeien; Beacon- Tom Holmes, Linda Hubbard, Chip Schwartz, Hudson Beach Glass, Carla Goldberg, Jessica Wickham, Kathleen Andersen; Peekskill-Jaime Martorano, Ada Cruz; Rockland-Eric Laxman, Elisa Pritzker, Barbara Gioia Smith; Newburgh-Carol Flaitz, Stuart Sachs, Richard Harper. New Paltz/Saugerties: Lisa Knaus, Gus Pedersen, Donna Blais, Bryan Barger. Grey Zeien painting on the wall. 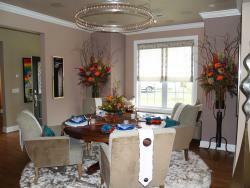 The designers are: Bill Miller - Bill Miller Interiors, Wappingers Falls; Charles Burleigh - Charles K Burleigh. 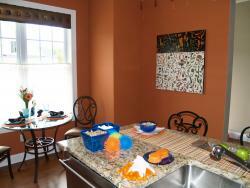 The highlight of this blue and orange kitchen is the Grey Zeien painting on the wall. Interior Design, Garrison; Phyllis Harbinger - Design Concepts/ Interiors, Cortlandt Manor; Maryann Syrek - M. Studio Gallery, Cold Spring; Nicole Ashey - Burlock Interiors, Beacon; Lithgow Osborne - Lithgow Osborne, Garrison; Gina Samarotto - Gina Samarotto Design, Poughkeepsie; Darron Andress, Jane Henderson, and Deborah Javier - FW Interiors Design, Wappingers Falls. The developers of Glassbury Court, Wilder Balter Partners, were thrilled to participate in this innovative project, Galazzo said. More photos are available online at pcnr.com, but you really need to go to this exhibit to appreciate the magic that good art combined with good design can produce in any living space. All of the artwork in this showcase is available for sale, and special events (to be announced) are planned throughout the public exhibition, which runs from June 2 through September 9. There is a suggested donation of $10 for the show house tour and related events, with a portion going to charity. No children under ten are permitted in the show house. For more information visit www.coldspringarts.com.